The Marquesas hotspot is marked 26 on map. The Marquesas Islands are a group of volcanic islands in French Polynesia, an overseas collectivity of France in the southern Pacific Ocean. 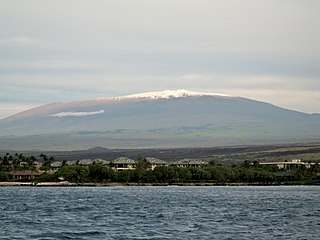 The Marquesas are located at 9.7812° S, 139.0817° W. The highest point is the peak of Mount Oave on Ua Pou island at 1,230 m (4,035 ft) above sea level. The Samoan Islands are an archipelago covering 3,030 km2 (1,170 sq mi) in the central South Pacific, forming part of Polynesia and the wider region of Oceania. Administratively, the archipelago comprises all of Samoa and most of American Samoa. The two Samoan jurisdictions are separated by 64 km (40 mi) of ocean. The Réunion hotspot is a volcanic hotspot which currently lies under the island of Réunion in the Indian Ocean. The Chagos-Laccadive Ridge and the southern part of the Mascarene Plateau are volcanic traces of the Réunion hotspot. With its 320 square kilometres, Hiva Oa is the second largest island in the Marquesas Islands, in French Polynesia, an overseas territory of France in the Pacific Ocean. Located at 9 45' south latitude and 139 W longitude, it is the largest island of the southern Marquesas group. Around 2,200 people reside on the island. A volcano, Temetiu, is Hiva Oa's highest point with 1,200 metres. Ua Huka is one of the Marquesas Islands, in French Polynesia, an overseas territory of France in the Pacific Ocean. It is situated in the northern group of the archipelago, approximately 25 mi (40 km) to the east of Nuku Hiva, at 8°54′S139°33′W. The Galápagos hotspot is a volcanic hotspot in the East Pacific Ocean responsible for the creation of the Galapagos Islands as well as three major aseismic ridge systems, Carnegie, Cocos and Malpelo which are on two tectonic plates. 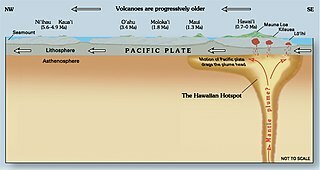 The hotspot is located near the Equator on the Nazca Plate not far from the divergent plate boundary with the Cocos Plate. The tectonic setting of the hotspot is complicated by the Galapagos Triple Junction of the Nazca and Cocos plates with the Pacific Plate. 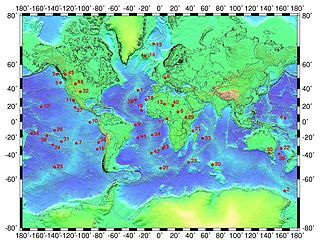 The movement of the plates over the hotspot is determined not solely by the spreading along the ridge but also by the relative motion between the Pacific Plate and the Cocos and Nazca Plates. The Marquesas Islands are the island group farthest from any continent in the world, lying between 400 and 600 miles south of the equator and approximately 1,000 miles (1,600 km) northeast of Tahiti. They fall naturally into two geographical divisions: the northern group, consisting of Eïao, Hatutu (Hatutaa), Motu One, and the islands centered on the large island of Nuku Hiva: Motu Iti, Ua Pou, Motu Oa and Ua Huka, and the southern group of Fatu Uku, Tahuata, Moho Tani (Motane), Terihi, Fatu Hiva and Motu Nao, clustered around the main island of Hiva `Oa.